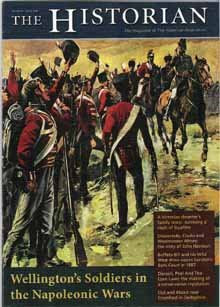 Just in: the latest issue of The Historian (No.97, Spring 2008), the magazine of The Historical Association (UK). Here’s the lowdown on our event in Montreal. Westmount Public Library has very kindly agreed to let us use their Westmount Room on the evening of Thursday, May 29 for our next event. Our sincere thanks to Ann Moffat, the Director, and Donna Lach, Programming and Outreach Librarian, who have been most kind and generous in their support. Their enthusiasm for the project is really heart-warming. So too is the support we’re getting from the local paper, the Westmount Examiner, where Matthew Surridge is preparing an article on us and the book. I’ve made a small poster/invitation (above and below) which is presently in pdf form, so if anyone would like a copy please let me know as the limits of blogging technology (and my capacity to understand these things) mean I can’t make this illustration more readable here. 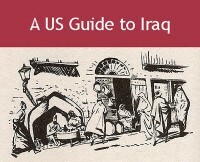 6:45pm Gathering and Reception with slideshow of pictures and illustrations of old Baghdad. Presentation by co-editors Mira Shamash and Tony Rocca (formerly of The Sunday Times, London). The papers have been showing pictures of Israel around the time of the birth of the nation sixty years ago. 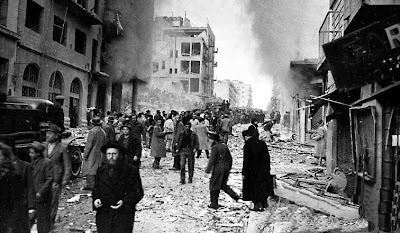 When this particular bomb went off — the date was February 22, 1948 —we actually lived in Jerusalem on Ben Yehuda Street in a big apartment on a high floor above the Cinema Orion. Although I was only six I remember it vividly. The cinema was showing a Sabu film. This was exciting for my elder sister Lena and I, as we were allowed to see Sabu films, and knowing the proprietor we could go in freely. Three car bombs exploded very early in the morning, probably around 6am. All the windows in our apartment blew in sending glass flying everywhere. What is it? “Bomba” we were told. Simon, my two-year-old brother was sleeping soundly in his cot the glass fell all over him but he was unhurt. His carer, Umm Aboud, had just woken up and was on her way to the kitchen to make herself the first stikan tchaii (glass of tea) of the day. The glass got embedded all over her chest and face and she had to be rushed to hospital. The proprietor of our building had just converted an apartment for himself in the semi-basement or first floor (I can’t remember which) and all the fresh masonry fell on top of him. He walked up to our floor covered in blood. I could see the apartments across the road where the block was sheared in half and some people were stuck in half a bedroom with no way out. – keep it free and tell your friends. 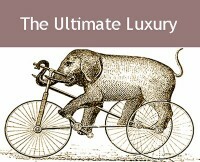 More details to come soon. HEMS the Hatch End Masorti Synagogue magazine has kindly printed a review of the book in their Spring issue. 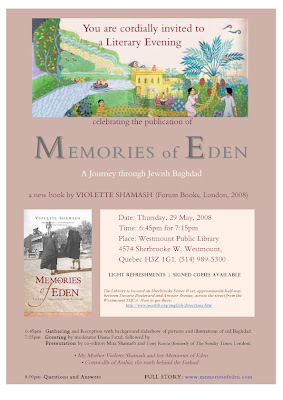 Memories of Eden is a vibrant and colourful tale of Jewish life in Baghdad from just after the turn of the 20th century until the terrifying days of the Farhud in 1941, which prompted Violette and her husband to leave Iraq. It is a fantastic read, full of humour and spell-binding story-telling, and tinged with the poignancy of the loss of a homeland, a community and an entire way of life. Violette was born in 1912 into a wealthy Jewish family, and a Baghdad that was worlds apart from the violent and crumbling city we are presented with in newspapers and on television today. Soon after her birth, and after four centuries of Ottoman rule, the British took control of what became modern Iraq. 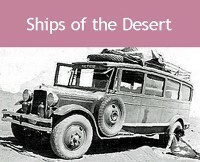 The move was welcomed by the Jewish community who at that time made up 40% of the population in Baghdad. As Violette describes, ‘so important were our menfolk that when they shut their shops, banks and businesses for the Shebbath, commercial activity in the main street ceased…In this predominantly Muslim land, Saturday, not Friday, was in effect the Holy Day’. In an intimate and familiar voice Violette describes frankly and vividly her feelings and memories of this lost world. To her young eyes it truly did feel like Eden. 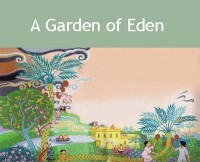 She talks of the stories her grandfather Heskel used to tell her ‘about the Garden of Eden, the Tower of Babel and the Hanging Gardens of Babylon, all of which were part of our fabulous heritage. And we were living right there.’ and her sense of pride and love for her birthplace is immensely powerful. As Violette grows, so too Baghdad flourishes and modernises. She describes a beautiful and civilised place where Jews, Muslims and Christians live in harmony. In each chapter she paints a picture of some of the most important elements of Baghdadi Jewish life in rich and tantalising detail – home life in the qasr (large house) built by her father and the glorious summer nights spent sleeping on the roof, the Sabbath and other Haggim filled with sumptuous foods and much entertaining, getting up to mischief at the Laura Khedouri School for Girls and the traditions surrounding marriage – Violette herself married David Shamash in 1937, an arranged match as was custom amongst the community at that time. But this fondly recalled life was soon to be ripped apart by events taking place on a larger scale. In 1939 the world was at war, and the Grand Mufti of Jerusalem who had been orchestrating a campaign of terrorist attacks on Jewish and British targets in Palestine, fled to Baghdad and began inciting hatred against the Jews there. The political climate was changing and local sympathies were swinging ever further towards the Germans. Events were to reach a head when in 1941 a military coup led by Rashid Ali al-Gaylani a ‘rabidly pro-Nazi lawyer’ seized control of Iraq. Over the following months things became rapidly worse for Jewish community culminating in two days of violence and murder – the Farhud – just as the British were about to regain control of the country. Violette’s recollection of the Farhud is both gripping and tragic and by the end of those two days over 900 homes had been attacked, almost 600 Jewish shops had been looted and 187 people had lost their lives. Even more painful is the knowledge that British forces had been stationed just outside Baghdad during the chaos, but orders prevented them from entering and restoring peace to the city. At the end of the book there is an excellent section written by Violette’s son-in-law examining the events occurring within British command that allowed this catastrophe. After the nightmare of the Farhud, Violette and her husband decided Iraq no longer held any future for their family, and Violette movingly describes her flight out of Baghdad towards the uncertainty of a new life.